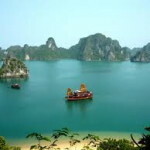 To travel from Sapa to Nha Trang, firstly you need to go back to the capital, Hanoi- Vietnam. 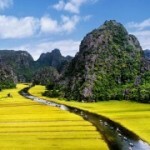 You can get Sapa Express or Sapa Train to Hanoi. 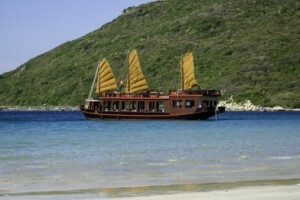 Indeed Nha Trang Bay is a natural world of sparkling sea, marine life and islands waiting to be explored in style. 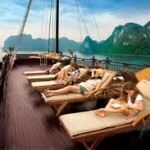 Emperor Cruises combines oriental style with contemporary luxury. Together these create the perfect recipe for exploration, luxury adventures, enchantment, relaxation and memorable experiences. The first luxury cruise operator to offer five-star experiential travel in Nha Trang Bay, the Emperor Cruises fleet is designed to be a sanctuary to ensure that every moment counts for the guests. The benefit of a luxury cruise with Emperor Cruises is that, apart from being small ships with personalized service and outstanding facilities, on an all-inclusive basis often there is no bill to pay at the end whether on a two- or three-day cruise. With Emperor Cruises, luxury doesn’t mean there won’t be adventure! Guests spend their time watching wildlife, scuba diving, snorkeling, boating, kayaking, embracing Mother Nature, and passing the time with their fellow passengers and crew. Your clients will be some of the privileged few who have discovered the huge difference that a small luxury ship with truly personalized service can make. Anything that is required, Emperor Cruises staff will make it happen. Emperor Cruises has been designed as a traditional ship but using high-quality materials with an exquisite gold-plated motif, fine silk, velvet and other luxury items such as brass, crystal and gem stones. Works of art commissioned from well-known Vietnamese artists will adorn the walls. This masterpiece will be a place for the most sophisticated travelers to enjoy Vietnamese culture, history and gourmet cuisine, and where royal glamour and heritage will combine to create the epitome of elegance. Each VIP customer will be treated like an emperor and experience the best of the best, in privacy, and with every detail attended to. Everything is designed in accordance with the particular requirements and preferences of individual travelers in mind. The private butler and reception services will be available round the clock. During the day there is a choice of activities or just relaxation; in the evening there is time to socialize, indulge at the spa or enjoy the ‘Movies Under the Stars’ shown on the sundeck. Guests can even go fishing for squid if the weather permits. On our luxury cruise there are only 16 passengers on board. Such small, boutique ships means they can slip into more exotic, unique and remote places in the bay. All cabins are en-suite with ocean views and with private balconies. Meals and drinks can be taken anytime, anywhere. The mini-bar is filled with complimentary drinks, including spirits. Guests also enjoy unlimited spa treatments and tai chi in the morning. 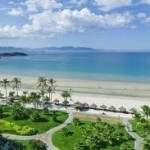 Emperor Cruises provide daily luxury return transfers by Mercedes Benz limousine service to and from Cam Ranh airport or a pick-up and drop-off service from hotels and resorts in Nha Trang. 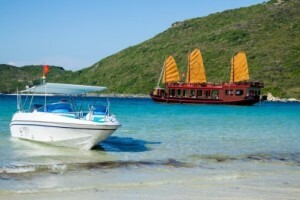 Upon request, we can arrange private charter airplanes, helicopters or sea planes to Nha Trang Bay. The boats are available for FITs, GITS, and Charters. We recommend this special experience for seasoned leisure travelers, luxury adventurers, honeymooners, families, and special interest travelers, nature lovers, active travelers and photographers, groups of friends, VIPs and celebrities.